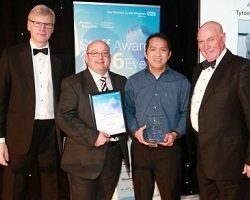 We are very proud to have sponsored the Support Worker Of The Year Award at the Pennine Acute Hospitals NHS Trust Annual Staff awards 2016. The winner was Tyrone Supatan, housekeeper, Physiotherapy at Fairfield General Hospital. Congratulations Tyrone! Read more at http://www.pat.nhs.uk/about-us/staff-awards.htm.